There is an old folksong by John Connelly that tells of a fisherman's idea of paradise. The song, known as "Fiddler's Green", could be describing French fishing conditions; a plentiful supply of fish, good wine and beer to drink after a long day's fishing, welcoming people, a gentle climate and clear blue skies. Admittedly, the skies may not always be blue, but France as a whole experiences gentle, sunny weather and most certainly provides a cornucopia of possibilities for indulging in a passion for fishing. You can comb the beaches and shallows of Brittany (Brittany Property Guide) for shellfish, take a boat out to the islands of France's Atlantic coast (The French Atlantic Coast), cruise the Med in a small fishing boat (or hire a luxury vessel with crew on the Riviera and enjoy a never to be forgotten experience), wade into the sparkling waters of France's unpolluted rivers to catch salmon or trout, or discover the hundreds of dedicated fishing lakes in inland France to put your skills to the test and try to land some of the most magnificent carp to be found in Europe. Expert fishermen will know, of course, exactly what type of fishing they enjoy and where to find it. For the rest of us, however, the decision may not be so easy. The very blessing of choice of types and locations for fishing holidays in France is also a curse in that it can be bewildering for the less knowledgeable. Some people adore fly fishing, others prefer a line and bait, and others want to be out on the open sea. For some, the excitement of fishing a mighty river is better than the tranquillity and calm of a lake, yet for still more, the lake provides the ultimate in enjoyable fishing. This is where advice offered by specialist companies offering fishing holidays in France is worth its weight in gold. So what are the choices? France is a large country which has an enormous number of lakes. There is no part of France where you will not find lakes, so if there is a particular region of France that appeals to you, you should have no problems pursuing your hobby there, but for many people who love lake fishing the ultimate destination is the Limousin (Limousin Property Guide). Situated just south-west of central France, the Limousin is France's own Lake District, with a massive proliferation of lakes all over the region. The lakes of the Limousin offer magnificent fishing, with carp and pike, idyllic surroundings and very reasonable prices for permits and accommodation. British interest in fishing in France increased tenfold after a television programme, part of the popular "No Going Back" series was screened telling the story of a British couple who bought a fishing lake in the Limousin and managed, after many trials and tribulations, to turn it into a profitable fishing holiday business. They have recently sold the business as a going concern to another British couple, and details of their fishing holidays can be found on www.clearwaterlakes.com. Current prices at Clearwater can be found on the site, with a week's fishing in Spring 2009 priced at £280.00 per angler on the larger lake, and £300.00 for exclusive use of the smaller lake. 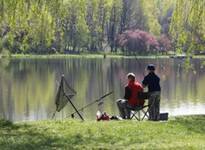 Angler numbers are strictly controlled to ensure the lakes are never over fished. The couple also offer accommodation which is additionally priced. 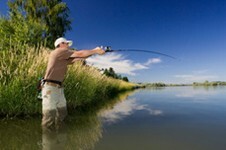 An advantage of choosing an all inclusive fishing holiday such as this is that you do not have to worry about permits. At Clearwater you can even legally fish at night, an experience not to be missed as the countryside around the lakes comes alive at night with the sounds of crickets, night birds and frogs. If you love the dramatic scenery of mountains, be they the soaring peaks of the Alps or the picturesque Pyrénées, you should not discount the idea of fishing holidays amongst all this natural glory. The mountains hide many secrets, among them some wonderful fishing lakes fed by mountain streams and melting snows, and offering perhaps the purest waters you will ever find. Take a look at the well known Alpine ski resort of Samoens (Samoens Property Guide), for example, which, once the snows have melted, offers fishing opportunities that you thought you could only dream of. Some of the best fishing in France is found in its rivers and streams, and once more, as there are so many of these in every region you will find yourself spoiled for choice. One region, however, is especially popular with river fishermen, and this is the beautiful Dordogne department found in the south-west of the country (Dordogne Property Guide). The department has some wonderful rivers, and so much natural scenery that even non-fishing members of the party may be persuaded to accompany you as you enjoy your dream holiday. Another region with some excellent river fishing is the Midi-Pyrénées (Midi-Pyrénées Property Guide). With clear, rushing rivers running down from the mountains through unpolluted and scarcely populated countryside, the region provides superb fishing and attracts fishermen from all over Europe with its charms. Consider the Ariège (Ariège Property Guide), not just great for fishing but also offering lots of interest for the rest of the family, with historic towns and castles perched on hilltops, prehistoric caves, unspoiled scenery and plenty of southern sunshine. The third type of fishing available to you in France is sea fishing. In a country with as much coastline as France, the choice is vast. You can stay close to home, with Brittany, Normandy (Lower-Normandy Property Guide, Upper-Normandy Property Guide) and the Pays de la Loire (Pays de la Loire Property Guide) all readily accessible from the UK, or travel south for some sunshine and a taste of the delicious Mediterranean fish and seductive lifestyle. The region you choose will dictate the type of fish you will find, with northern Atlantic waters around Brittany and the Charente-Maritime (Charente-Maritime Property Guide) bringing Sea Bass and Mackerel, and the more southerly Atlantic down near Biarritz (Biarritz Property Guide) offering Conger and Skate or even Tuna and Bream. A fishing holiday in the Mediterranean could net you Tuna, Merlin and Swordfish. Once more, there are many specialist companies offering dedicated sea fishing holidays, and it is strongly recommended that you take this option to make the most of their experience, especially for deep sea fishing. Of course, as in Britain, there are permits and licences to consider as well as some rules and regulations. Fishing is not a free for all sport, and sometimes the rules can be a little daunting for the uninitiated. There are areas and times of year when "No Kill" zones are in operation, and certainly, for many lakes and rivers you will need to purchase a permit in order to fish. There are even some types of fish (classified as pests) which must be killed when caught, and it is actually an offence to throw these back, alive or dead, into the river. The waters are policed, and you could be required to show your permit at any time. If you are fishing purely for a short period, say a holiday of two weeks duration, it is possible to buy special holiday permits. Permits are usually available at local Tabacs, but if you have any doubts about local rules it is advisable that you should go to the Marie of the town in which you are staying to check the rules. If you are taking a package deal, with fishing included, it is likely that the permits will form part of the package, but always check in advance. The ultimate indulgence is, of course, to purchase a property in France near to good fishing so that you can enjoy the sport and the joys of French life at any time you choose. Once more, this is possible in any area of the country, but if the budget is tight the Limousin is probably the best region for value for money, and it also has the advantage of having the largest number of properties with their own lakes attached. At the time of writing it is possible to find a 43-hectare lake, stocked with carp, for under £15,000, a lake with building land for around £45,000 and properties including a house and a lake for anything upwards of £89,000. Try finding this in the UK! France is paradise for fishermen... or as near as it gets at least. The variety of fishing, different types of fish to be found, climactic conditions and the wonderful scenery, gastronomy and, not to forget, the wines, all add up to a very special type of fishing experience. Next time you see that note on the door that says "Gone fishing", chances are that the writer will be heading for France. Happy fishing! Hi there - my friend has purchased a small lake. He was told by the previous owner that he had the right to fish a metre all round the lake as one bank borders on a farmer's land. Is this true in French law? Alternatively the Mairie is a good place to go, they should know what is allowed and what isn't.